Gegatrade Pro EA is based on the fact that most of the time the price usually moves between the upper and lower boundaries of the trading channel. Basing on this fact, Gegatrade Pro places its first trade, assuming that the price is going to return to its average value and take the profit which is defined. If the price leaves the trading channel and continues further in this direction, then Gegatrade Pro starts its “cost-averaging strategy” which will add new trades from the same direction based on its Mathematical Algorithm and increase the overall position. When a pull-back of the price occurs, Gegatrade Pro closes the whole basket of orders. It is advised to use Low spread ECN brokers with a starting balance of 3000. Counter trades (Hedge) lot size calculates as percentage of main lot size. Example: if initial lot is 0.10 and CTinitial lot is 0.3, then CTinitial lot will open 0.03 lot. CTLotSize_1 = CTLotsize corresponds to percentage of each main level, there is 10 Levels to set you can define each CTLotsize with a percentage of the main Level. In order for the "News WatchDog" Feature to function, you should check box Allow WebRequest and add “http://news1.gegatrade.com” into your WebRequest URL list. Great EA with steady profit and live signals from the developer! Very good support from David! Thumbs up and many thanks! It does not take any position other than AUDNZD. We are using all the set files distributed. I will update my rating once this problem is resolved. All Martin's EA will explode sooner or later. And this EA is selling too expensive. The creator does not update the current file set. Excelente Ea y soporte por parte de David ,me gusta mucho todos los perfiles que uno puede usar. Great EA. You need to have proper money management as mentioned by David. Recommended! 22-12-2017 Still one of the best EA's arround. If you stick to your smart money management plan it can be very profitable. Lo más grande de este ea, aparte de su rentabilidad, es que perdura en el tiempo. Ha llegado a ser y es todo un clásico, pero lo mejor es que cada actualización se presenta como un producto nuevo y mejor si cabe que el anterior. La gran sorpresa y la honradez que deja el autor, es que este producto sigue unas pautas de mejora que nadie es capaz de mejorar en el contexto. Me explico, hay autores que lanzan el producto y más adelante lo abandonan pero sacan un producto con otro nombre que bien podría ser una continuidad del mismo; en este caso esto no pasa aquí, en Gegatrade se sigue una línea en el tiempo de mejora que invita a tenerlo en Metatrader porque es un producto que brilla y su autor sabe como hacerlo brillar. Es un producto sorprendente si sigues las pautas de su autor que ha dejado escritas en su admirable blog. Getrade es sorprendente y según pasa el tiempo no se degrada. Pienso que es el mejor EA que tengo sin excepción. I have purchased the EA the beginning of this week and I am running it on few Demo's. Testing few set files provided in the blog and so far so good. David was very quick in helping me through TeamViewer when I had a problem with the news feed. I will update the end of the month. I can vouch for consistent performance over the past 1 year. Excellent support from the vendor. Highly recommended. After 10 years of forex trading, mostly with robots, this is the first one I have seen that has stood the test of time and is realistically priced. Keep up the good work David!!!! Verry nice ea Whit contineu profit every day nice profits! Fantastic EA, I've been using it since month now and the results are really amazing. When trades goes your way, you will be receiving $0.50/pip. When trade doesn't go your way, you will be in DD of thousands. In order to earn a reasonable income on a $3k balance for 1 pair, you need the trade to go opposite so that martingale can start and eventually you will close in ten or hundreds instead of cents. Just doesn't make sense for me. Its a very good ea, you won't regret to pay for it, you will get more than what you paid. nice ea overall,good support from the author,news filter is an asset but one should never get greedy we should follow his advice strictly . Very happy customer. EA performs very well and support from David is exceptional. A great investment. just paid for gegatrade pro, excellent result ! Hi, i rented today Gegatrade, but there is one alert that say: " NEWS DOWNLOAD PROBLEM". First of all, I would like to thank David for the best support. I am using Theorem and Gegatrade Pro 4 pairs. These EAs are making profits everyday. I am planning to deposit more money and increase lot size. If you use both EAs, you can take mutual supplementation effect. David, you are the best. Thank you very much. I have rented the EA for a month to test and it is very good. I use it in EURUSD with safemode setfile and it gives a consistent small harvest everyday. I have rented GEGATRADE PRO from today and I have to say David has been incredibly helpful. He never seems to tire of all my questions. Will report my progress in a few weeks. Seit einigen Tagen benutze ich GegaTradePro und habe bis jetzt nur positive Erfahrungen machen können. Ich nutze bewußt nur 0.01 Lot als feste Grundeinstellung bei 10.000 Dollar Kontobalance. David ist unermüdlich beim helfen und hat nie schlechte Laune, auch wenn manche Verständnissprobleme nicht sofort, sondern erst nach mehrmaligem erklären geklärt sind. Er ist ein super Entwickler und ständig bereit zu helfen. This EA is a real gem, this is not a scalper EA which is good, extremely happy with EUR USD settings. Also, David is very helpful, and after running the EA for more than a month, most trades are closed within a day. no holding on for long (which is quite dangerous under current market condition) Thank you heaps David for all your help.. If u want an EA for long term trading , then u need to buy this! GegaTrade Pro is a master at staying away from High Impact News and Weekends, therefore staying away from uncontrolled Volatility. David has been great as well, we got into a little argument in the beginning about getting setup then, after that we worked it out, talked about it, and worked it out like two adults, and we really appreciate his great attitude. Our testing results have been great with GegaTrade Pro, LIVE and DEMO BOTH... especially after rebuilding our account, after trying to start with $1,000(NOT RECOMMENDED AMOUNT) it grew to $1,700, in less than a month... Then, the next week we were in fear of losing it all! We contacted David for help and he reminded us about the $3,000 at least, Starting Balance and we knew. So, we ended up salvaging account down to $1,400 and grew it with our Manual Strategies to get it to the $3,000 mark for Automation. Now making over $1,000 a month. I would advise $5,000 balance for ABSOLUTELY NO FEAR, You'll still be fine with $3,000 but, if it's negative -$1,000 it might scare you a little, never really goes over that, unless your modifying and trying to do your own settings or something like that. So, Yes, we do recommend Gegatrade Pro. Happy Trading Everyone. Thanks again David. I have test the EA for over 25 days on a demo account, I have try different settings and best balance for my use after I could run good profit I have start yesterday on my real account. Every time I have set the up different settings or have problems with the EA i have talk to David he have help me wihtin 24h, he have fit my setting, setup up for my account. I have try many test on strategie tool so be carefull to got high profits you got very high DD. To got Safe profits need try the settings of david and the DD is not at high. After 24h my profit was on real account now over $30. The Ea need a very good setting file so talk afterbuy/before buy to david and he will help you setup or fix your settings. At the Moment i give to the EA all 5 Stars. Great Support, good profit, cheaper and better then any signal. Be sure to win 1 trade is not the work of the EA, the EA working vs the actually trend and open every time little higher orders. 1-5 orders maybe more after order 3-4 are in win the EA close all 5 Orders. After all you have 4 win Orders with high profit and 1 lost order. David, thank you for caring about the users that used your EA. I am happy with my program Gigatrade Pro very. О какой чудесной поддержке говорят люди в отзывах не понимаю если автор предоставляет файлы настройки (кроме EUR) только после того как оставишь отзыв. Купил советника три месяца назад, за это время автор постоянно то открывает то закрывает свои сигналы, myfxbook нет доступа. Августовскую просадку прошлой версии с небольшими убытками я ликвидировал вручную только недавно (советник был остановлен после 8 го удвоения). А теперь автор еще заявляет что получить файлы настройки для советника EURGBP и AUDUSD которые сам предложил я могу только после оставления отзыва. Great EA and support. Well worth the investment. I am also of the opinion that this EA works very well given the right risk management. News filter + addition of RSI and distances make it a a very good advanced martingale with an edge as far as lot management (ie: it does not double each position as true martingales do). You need to keep your eye on it as any other EA but I am very happy with it and profits have exceeded its price. Lastly, David continues to optimise it and to be honest offers probably the best customer service I have experienced on the market place. This is an excellent EA if you understand how it works! It is really powerful now with the new RSI features and the features that allow you to set minimum distance in candles as well as in pips before next recovery trade is started! Am extremely impressed with the effort that the developer has put in! David also provides excellent support! I have been using this EA for about 2 months now on live account and have generated good profits. so far very good EA but you need to be very careful with setup and you need to have sufficient funds! Si tous les parametres sont sur "safe", cet ea produit de bon résultats assez constant, sans trop grand DD. David est très patient et d'une grande aide. Good EA, each consultation David are quick to get a reply. Don't trade with low balance. Nova version distance function but still have not seen it work, I can not express serious opinion. StopLoss is set in money, I am sorry for those who have not set and exploded his account. EA makes profit but being martingale is a little follow. David seriously and responds faster. I think a higher leverage is needed for this EA. Generally this EA is good. Very good EA, each consultation David are quick to get a reply, but run to read carefully, I only used for EUR / USD, really can make money, I give 5 stars. This EA is very professional. The author is also very responsive. don't trade with low balance or attach to multiple charts like beginners who leave bad review. Gegatrade Pro has developed a lot of extra functionality since it was first launched. I have found it profitable but I do not run it all the time preferring weeks when I consider the is not a lot of trend making news. The addition of the time filter enables you to run pairs in their quiet hours which has worked well for me with pairs other than EURUSD. There are very many settings which gives great flexibility. David is very helpful and implements suggested improvements very quickly. I agree with Olli below. The support is excellent and responsive to my need. He even volunteered to give me his backtest EA version so I can test and optimize my own settings. The EA is solid. The author however is willing to listen to inputs to continually making it better. Keep up the awesome work! Update: I agree with MateiMihaescu and Jessie Pham: read the manual carefully several times, do not underleverage or having less than $3000 , be watchful of # of positions opened, etc....this EA will for sure making you good money with controlled DD, especially with the new features Martingale pause, widen distance, RSI filters, etc....Thank you, David, for programming such a comprehensive and wonderful EA. I have bought till now 9 EA in about 7 years. I have proved many strategies,and many automatic systems. Like many traders I used to think that some systems, like Martingale, Hedging and Scalpers will ALWAYS will blow up you account. I learned with the time that in trading, like in all the aspects of the life, there is not absolute truths. The Martingale system, like all the systems in trading have strict rules. Those rules includes that your account must not has low balance. David recommends at least 3000 usd to start... and I agree absolutely. The most important rule (in my opinion) is have a Stop Loss.. and you must to do your own backtest based on your own balance, and with the level of risk you want to take (always using SL). 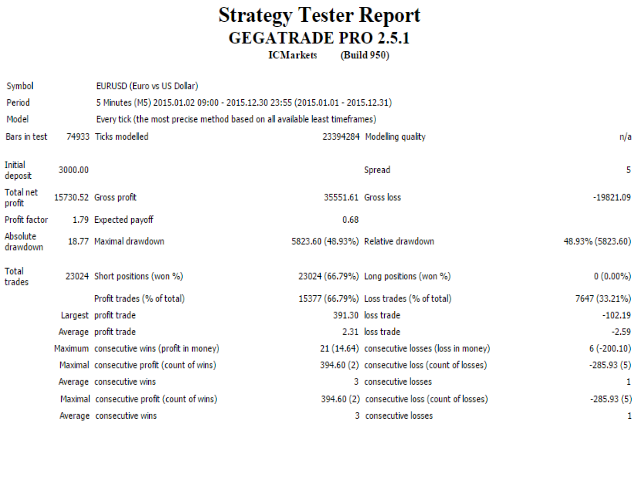 Gegatrade Pro HAS the possibility of set a Stop Loss... and since I bought Gegatrade Pro, this is the way that I use to trade with this EA... always with profit. - If you follow ALL the rules, you will make money. - This EA have a high frecuency of trading... and you will see the profits all the trading days. - I never (NEVER) have had better support and comunication like that I have had with David. He is the best. with only 8 steps opened. David response to my questions and configured personally the "safe" settings that blown the account. Once i was in trouble and i asked HELP, David didn't response anymore to my answers. also his signal was deleted. i am sorry for people that had account blown away. Hello David and fellow traders. First I want to thank David for the best support. Always very fast in response to any questions that I had. I am testing this EA for the last 2 months. I can say I survived the last situations on the EUR/USD where a lot of users failed. I am testing it with 0.01 lots on an aggressive set up with 10 steps maximum. I only use more steps when price goes a lot on the wrong direction. I pause and wait until price goes to the next big support or resistance. Then let the steps run again, one or two more steps. Also my testing accounts are way bigger than 3k. I have been using it on 12k and 25k accounts. ECN and 1:500 leverage. I always ended up recovering the losses and also got in profit. The new feature that David said that will be available to allow to change the distance of the steps separately will be extremely good. I have seen this type of strategy making a lot of money in a couple of months with almost 100% gain per month. This EA is way better from what I have used in the past ( same principle ) and it has a lot of sets where you can minimize the risk. If you try to use it to make 50% to 100% per month for me that is very close to gambling. It can be done but the chances to succeed are very small. To sum up everything I think is a remarkable EA that needs attention and some trading skills. For those that want to start trading with 3k I would say that the new feature with the distance adjustment of the steps will help a lot. Also I have seen a lot of screen shots of accounts ( on the comments ) that where using 3k or even less with 12, 13 and even 16 steps opened. That is to much for a 3k account. When using a 3k account I think is better to limit the steps. I can't trust him and his product and his signal. A lot of people were using EA with recommend settings and enough balance, but EA burned big money. David,any compensate for it? Martingale without any good algorithmic method. I bought all systems 4.5 to 5 star in this market. For sure this is the best and the only one that interested me to leave a rating. It's plug and play. Read at least three times the instructions and you will be safe. My first review after trying a couple. A very intelligent product from David. The news suspend system is awesome. Only trade safe as he would always advice. It's a 5 star for me. Update- 10.08.2016: Refer to fiona029's comment below and be guided. We are not unaware of the risks involved in trading martingale...except of course you're a newbie. This piece however wins consistently. I've used this EA for months now and it's hands down the best. Great EA , and perfect customer service by Mr. Zouein. This EA has return my investment for 45 days . It works good 24 hours ,and make money even when you sleep . With the news suspending function the risk is reduced to minimum . All questions that i have was resolved very fast from Mr.Zouein . I reccomend Gegatrade Pro 100 % ! I have used this expert advisor for the last Three Months. At the beginning I was very much confused about the setting but it always make profit in little. after the Second time rental on 4th June 2016 I used Fixlot with $ 2969 with the lot size of 0.5 in short direction on GBPUSD AND EURUSD chart it give me $7215 on 24th june 2016. Still it gives profit daily. Thanks for you quick and very professional support!! Very good procedures, to avoid the news. Stable profitability. Thank you very much for david. When you buy this EA you get excellent support and a step further than your regular averaging down strategy. it is reliable and highly profitable whilst protecting your deposit with a unique news filter with many safety options to satisfy everyone. Gegatrader pro is very good EA and Mr Zouein is helpful and answer very fast. I have Tried many EA and this is the greatest. Very good EA. If you adjust the settings, it is very lucrative. David support is very good. 5 stars. Great ea, and great support from David.Nothing is perfect but if you maintain conservative settings and have some sort of exit strategy to get out of a strong trend, you will make money with this ea. Basically this EA risk the whole deposit with the aim of highest & consistent possible gain using Martin. With the excellent news filter it manage to avoid most volatility cause by the news. However, it has a weakness when there is small opposite movement before high impact news sometimes take hours or days to form which will cause it goes into DD. Backtest will show there is a few times when the price move beyond the default number of averaging position which is risky. If it can incorporate a hedging capability and able to set off the gain with the DD positions either in full or partially this EA will be perfect. David is one of the rare developer whom really want to help his clients to earn with his EA. He always answers my doubts promptly and always advice me the best. Because of this, people have faith in his product because he will always look on improvising them. He is also very nice to share the settings and how each of them work! Thanks alot! Will review again after 6 months. If you ask about support, David is excellent. Although it is 4:00 AM of his time, he still wait for support me. After he adjust the config, I always got profit from this EA. This is WORLD CLASS EA. I give you 10 stars. I rent Gegatrade pro for almost 3 weeks and works very good. I gained nearly double of rental fee although I stopped trading Brexit week. 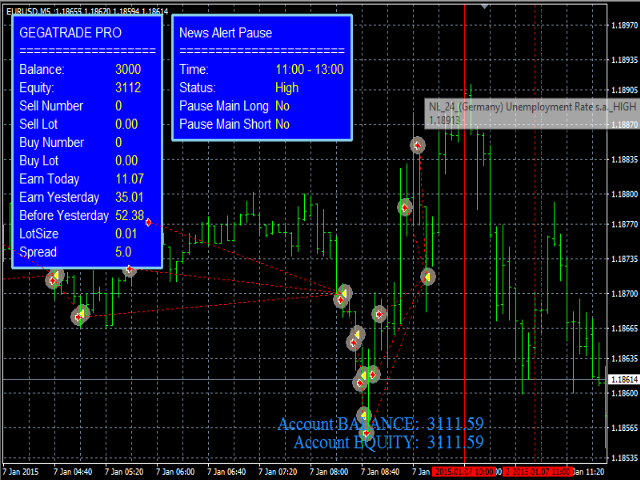 News watch dog system for safe trading is very sophisticated as everyone said. Now I'm confident in this EA so I decided to buy. 5 stars for good EA and good support. Just wanted to add my comments that David Zouein gave me great support made himself available to help set the EA. He give's a really good support. So far the demo gave great results. Keep up the good work for the trading community. I use this EA about a month, it's very excellent. Not only to trade EURUSD, I also try it in USDJPY and got good result. This EA is very excellent. I used a lot of EA, this is my recommond best one. Интересная идея реализации Мартингейла. Автор очень быстро отвечает, поддержка на высоте. Для работы можно использовать авторские сеты в трех вариантах: безопасный, умеренный и агрессивный. Попробуйте найти свои инструменты, например, у меня получились хорошие результаты с JPY. Используйте тестер, экспериментируйте с интервалами приостановки торговли. Не жадничайте, используйте 0.01 лот на 10-15k и периодически выводите прибыль, т.к. всё таки это Мартингейл. Успехов! Nothing else to say, just that this expert really works, just be carefull with the settings before using, I use it with EURUSD on time frame of 4 hours and minimum fixed lot on a 500 USD account, also I take the care to pause the non-trend direction, so mostly of the times I work only on the trend direction, it is not safe to be afk working on 2 directions with a small amount of money, this EA needs at least 3k USD deposit to be left alone by itself. One month later the return is already 50% with DD less than 15%, so I am very satisfied. I was worried at the beggining due to the pure averaging/martingale system, but the news monitoring feature worked flawless and you can work on higher time frames in order to avoid the bot throwing a lot of orders in short time spam then your account will be fine. It simply works as it says. 1st buyed EA that realy Works !!! Im trading on live account in minimum lot. So far it's doing very well. The news suspending function is great. The order & lot calculation algorithm is great. The support from developer is superb. Daily average of about $100 profit. I am pleased with this EA. I asked him a crop of questions. His answer was kind and precise. Thank you very much for it, Mr Zouein. Developer is very helpful in any matter. I am very satisfied. Mr David Zouein and his EA´s are WORLDCLASS ! He explains everything very friendly and with infinetly patience. It is the best support I ever had and GEGATRADE PRO is the best EA I ever bought. With this EA´s you are independent from SIGNALS and you can trade on your own risk. Thank you very much for it Mr Zouein. Added Past News Events until March 2018. Now past News Events built into the EA are from January 2015 until March 2018 for all Major Pairs. Fixed flickering of News lines on the chart. a small glitch that does not affect trading. 3 - "PauseAfterLevel" This function lets you pause the EA when it reach a curtain level of its Martingale. Increase the number and EA continue where it left. 4 - SendPushNotificationOnDD send Push Notification about your DrawDown. Stop Loss small Bug Fixed.